In your recent article describing our efforts towards Black-Jewish reconciliation Anti-Defamation League national spokesman, Abraham Foxman described the Neturei Karta as "pariahs of the Jewish community for their condoning and support of the enemies of Israel and the Jewish people. "Although we understand the limited knowledge of Jewish history and theology which produced this bit of unmitigated nastiness, it is still necessary to set the record straight. 1) Opposition to the establishment of the state of Israel was, from the inception of the Zionist movement until 1948, nearly universal among Torah Jewry. Those expressing themselves ranged from Reb Chaim Soloveichik and the Lubavitcher Rebbe in eastern Europe (R. Sholem Dov Ber Schneerson) to Rabbi Samson Raphael Hirsch in Germany. After 1948 hundreds of thousands of Jews continued this tradition of total rejection by a principled refusal to participate in the state and accept its many financial benefits. Their ranks included Misnagdim such as the Brisker and yishuv ha-yashan and Chasidm including Toldos Aharon, Satmar and Breslav. Others following the Agudah world view (as explained by Reb Reuven Grozovsky in his Beyos haZman) decided to make the best of a tragic mistake by participating in Israeli politics in order to support Torah interests. 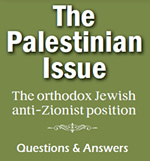 Thus, principled opposition to Zionism is very far from a "pariah" viewpoint. As to "supporting enemies of the Jewish people" this slanderous canard almost deserves no response. The record of love of all Jews evidenced by Neturei Karta leaders such as Reb Amram Blau and Reb Aharon Katzenellenbogen (of blessed memory) is well known. It was real love delivered amidst the poverty of Jerusalem where their ancestors had lived (incidentally, at peace with their Arab neighbors) over the decades long before Zionist aggression created anti-Jewish hostilities. As should be obvious our efforts to meet with Arab leaders (before it became politically correct to do so) and with Minister Farrakhan are intended to decrease anti-Jewish sentiments. And we'd be willing, any day, to compare our results at achieving good will to those achieved by ADL denunciations and intimidation. May God grant true peace among all peoples.